Harry Turner works for the CIA like his father Leonard. He wants to do fieldwork but he’s constantly being denied. He’s stationed in Prague and his father’s good friend keeps an eye on him. Later they receive word that Leonard, who was in New Jersey making sure a piece of hardware called Condor arrives, that Leonard and the Condor’s been taken. The Director tries to find it and Harry wants to help but won’t let him. So he bolts and goes to New Jersey. The director decides to let one of their agents who is Harry’s ex to find Leonard and the Condor. 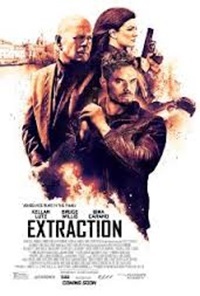 The makers of “Extraction” use the same marketing gimmick as used in films such as “The Cold Light of Day“, “Fire with Fire“, “The Prince” and “Vice“. It’s the famous Bruce Willis magic trick. Actually, it’s dead simple. Make sure this star actor of yesteryear (I have to say I was always a big fan of BW) participates in an upcoming B-movie. However, the length of time you can admire him is limited and his presence is evenly spaced. You let him turn up at the beginning of the movie as an appetizer and give the impression that this might be a real Willis movie once again. Eventually, he disappears for most of the film and pops up again in the end for the big reveal. Then place him centrally on the cover so future viewers will get the feeling that he’s playing an important part in it. I’m convinced that this is the biggest marketing trick that ensures the necessary revenues. As a viewer, you feel cheated though. Yep. The “Die Hard” star adds just another B-movie to his record of achievements. I must admit that the beginning of the film provided a momentary enthusiasm. For a moment, I had a feeling the old Bruce Willis was back and I was getting ready for some cool one-liners and beaten up opponents. Yippie kai yee! The result was a short-lived excitement, because before you know it the Willis marketing trick reveals itself and he disappears like a white rabbit during that well-known magic trick. Not in a black hat, but in the murky world of terrorists who captured a device called CONDOR. When activating this device, telecommunications will be disabled worldwide. Or something like that. Time for Kellan Lutz to show up. He plays Harry Turner, a CIA analyst who would love to follow in the footsteps of his father, but his application is always refused by the respective services. Until the day comes when someone kidnaps his father Leonard (Bruce Willis). Despite the explicit prohibition of his superiors to get involved, he still heads out to defuse that CONDOR. And this with the help of this other field agent Victoria (Gina Carano). And what a surprise, she’s someone Kellan had a brief relationship with before. Who would have thought of that? What follows is just a cheap Secret Service action movie with the necessary fight scenes. And with of course the obligatory locations such as a biker bar (starring some billiard balls and a broken jukebox) and a trendy nightclub. Carano showed already in “In the Blood” that she can stand her ground in such dark clubs. The story brings nothing new and is full of familiar clichés. Even the denouement at the end was predictable. Not quite a good movie, you might say. The same can be said of the performances. Willis plays another comatose role and looks quite pathetic and uninterested in the few moments when he’s on screen. Lutz and Carano make the best out of it and during the action scenes, the entertainment level rose a bit. And then there’s the fact that Carano’s curves are certainly a feast for the eye. I wouldn’t date her though. Not with this testosterone-filled chunk of energy. Before you know it, you’re stuck in a stranglehold that can be fatal. For now I’ve lost all hope for another brilliant Bruce Willis movie. Yippie ka … yeah yeah yeah!